Open thread: anyone have any beautiful pictures/stories to share? Almost three years ago we spent two days hiking inside the crater of Haleakala, a dormant volcano on Maui. We were on the island for a friend's wedding and would be spending three nights at a luxury resort (not by our choice, it's not our cup of tea). So when we planned the rest of our trip, which doubled as our honeymoon, we wanted to find ways of saving money elsewhere. One of those ways was to reserve one of three rustic cabins inside the crater of the volcano (accommodations include outhouses, non-potable water, propane hotplate, and bunk beds) that are maintained by the National Park Service. This turned out to be the best part of our trip, hands down. The cabins are totally remote; almost nobody makes the long hikes down to the crater's floor and once we were there we saw only a couple of other people over the course of two days. The scenery is stunning: our cabin was in a sandy, nearly barren moonscape, while the one we hiked to on our first day (just a few miles away) was in a rain forest. On the last day we sort of faced a dilemma: our car was parked back up a very challenging hike out of the crater, but I was really sore and tired. 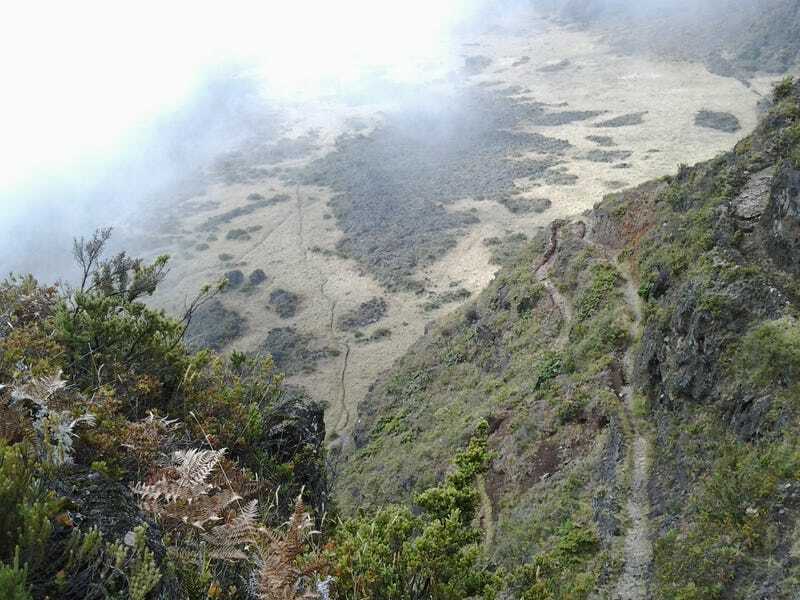 So we decided that my husband would take the more challenging route to our car and I would hike across the crater's floor to another route out. The picture above is from my climb out of the crater. As I hiked up the path cut into the side of the cliff, which you can see snaking around on the right side of the picture, I turned around to get a shot of the crater floor way below me. You can see the thin ribbon of the trail in the middle/left of the picture. As someone who had never done a multi-day hiking trip, and had never hiked alone, I was so proud to see how far I had come by myself! If anybody has any beautiful pictures or stories of fun times to share, post them here!